Some 38,500 participants run in 2019 Seoul International Marathon. March. 18, 2019 07:37. by Seung-Kun Lee why@donga.com. The skies were deep blue and the temperature was of perfect level for runners, whose hearts were pounding loudly enough to bring spring to Seoul. 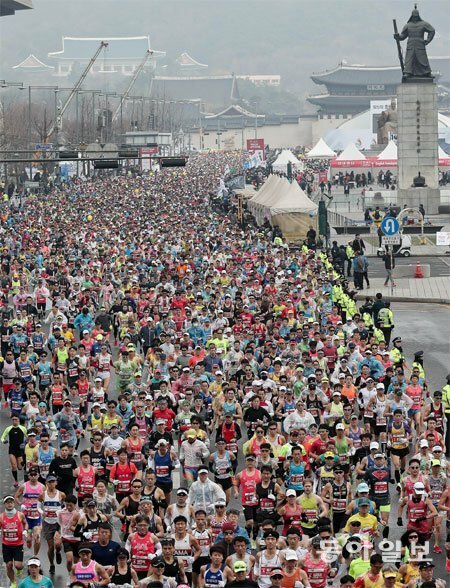 The 2019 Seoul International Marathon, also known as the 90th Dong-A Marathon, opened Sunday in the city area of Seoul. Including 3,800 foreigners from 66 countries all over the world – China, Japan and so on, a total of 38,500 runners joined Korea’s No.1 marathon event, making this year’s event the largest-ever of history. As a “Gold Label”-holding event accredited by the International Association of Athletics Federation, the marathon race was full of record-breaking runners. Kenyan athlete Thomas Rono won the Seoul International Marathon with a record of 2:06:00, his best record as well as the 5th fastest record made in Korea-hosted races. Among the Korean men runners, Shim Jung-sub of KEPCO, ranked 8th with a record of 2:12:57, making his best record. Ahn Seul-ki of SH Corp. set her new record of 2:27:28, claiming the title this year, following 2016, in the Korean women’s division.